Odds on elections in the United States are one of the most popular political betting options available to bettors, both in the U.S. and around the world, who want to wager on which candidates will represent the nation at various levels of government. This year, the 2018 Midterm Elections could potentially bring in more action than any election prior – at least until the 2020 presidential election, and it’s important to know a few things before betting on election odds. We’ve reviewed and put together a list of the best sites to bet on the midterms and other political races to inform potential bettors where it’s legal and safe to wager on the 2018 Midterm Elections. Yes, there are no US gambling laws against betting on the 2018 Midterm Elections when a bet is placed from a legally sanctioned domestic sportsbook or a licensed offshore sportsbook. US laws are directed towards the sportsbook operator and not the bettor. Offshore sportsbooks have been servicing the United States for many years and have developed a stellar reputation among industry professionals. The sportsbooks listed on this page have been selected by our team for their fast payouts, top-security features, and convenient banking options. Bovada is offering more than 40 betting lines on the 2018 Midterm Elections, which is more than most of the other bookmakers. They are covering the Senate, House and Gubernatorial races, and include prop bets targeting majority outcomes and party results. Their range of betting lines outperforms the competition. You can view the latest midterm election odds here. However, the polling for the U.S. Senate paints a very different picture. In total, 33 of the 100 seats are up for grabs, but the latest polling suggests the Republicans will not only keep the Senate but will even gain one seat, increasing their number of held seats to 52. The Democrats could potentially pick up Arizona but are expected to lose Senate seats to the Republicans in both North Dakota and Missouri. All 435 seats in the U.S. House of Representatives are up for grabs during this midterm elections, and the polling suggests a huge Democrat victory across the board, picking up 36 seats based on current predictions. If this hold true, the Democrats would take control of the House from the Republicans, since a total of 218 seats are needed for a majority. Although there aren’t any betting odds currently for state ballot measure, we put together a list of all the states that will have a gambling-related measure on the ballot. You can find out on that page if your state is voting on gambling during the 2018 midterms. Is it legal to bet on the elections in the United States? Yes. 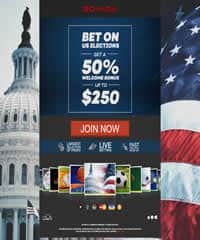 There is no law that prohibits betting on the 2018 Midterm Elections or any other election when using online offshore betting sites. Each one of the sites we’ve reviewed are licensed in the country they operate in and each are 100% legal, safe to use, and guarantee payouts on all winning bets. What is the best site for betting on the 2018 Midterm Election odds? For this year’s election, we recommend Bovada due to this site being one of the most trusted online sportsbooks In the industry, but also for a large amount of betting odds currently available on for this election. What odds can I bet on for the 2018 Midterms? Currently, Bovada has over 40 betting lines with odds on the congressional majority in addition to individual lines on gubernatorial, U.S. House of Representatives, and U.S. Senate races. You can check out all the betting odds from Bovada on the 2018 Midterm Elections and other political futures here. How do I bet on the Midterms? Here is a step-by-step guide for betting on odds for the 2018 Midterm Elections. Make an account at one of the above-mentioned legal betting sites. Select a currency: Bitcoin and other cryptocurrencies are the fastest. Choose how much money you’d like to deposit into your account. Wait for transaction to process: Cards can take up to 24 hours; crypto is instant. Feel free to check the status of the deposit or ask other questions with their 24/7 chat. Go to the Politics section on the betting site. Find the betting odds you’d like to wager money on. Choose the amount you’d like to bet on for the odds you selected. Click the “Confirm Wager” or “Place Bet” option when you’re ready to bet. Wait for the results of the election to come in and if you guessed right, then choose to receive your payout and collect your winnings. This year’s midterms will be held on Tuesday, November 6, 2018. The polls open early in the morning, and polls on the west coast will be the last to close. When will I know the results from the 2018 Midterms? The ballots of each state will start being counted immediately after the polls close for that state, which is typically 7-8 p.m. in that state’s time zone. The outcome of a bet will become official once all the ballots for the state involved in the wager have been counted and the results are made public.